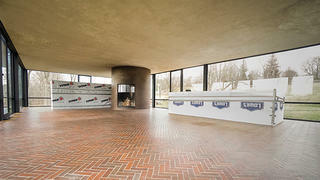 Fixing the Ceiling at Philip Johnson's Glass House: A No-Brainer? Not Quite. 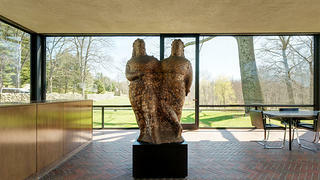 Managing a property with 49 landscaped acres, countless pieces of sculpture and artwork, and 14 structures ranging in age from 23 to 69 years old—all of which once belonged to one of the most famous 20th-century architects—may not sound like an effortless walk in the park, but then, who would expect anything different at Philip Johnson’s beloved and architecturally groundbreaking Glass House? The National Trust Historic Site in New Canaan, Connecticut, was making waves even before construction started on Johnson’s boxy glass-and-steel house. Nestled in a residential neighborhood that attracted Modernist architects like Johnson in the mid-20th century, Johnson situated his house overlooking a valley and dense clusters of trees among a sweeping landscape of gentle hills. In 1949, construction finished on the house, and he lived there with his partner, David Whitney, until his death in 2005. 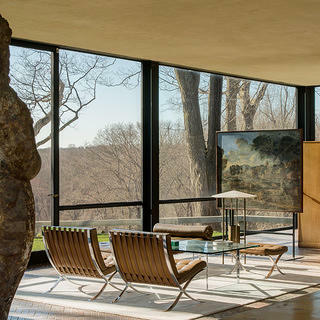 Fast forward to December of 2017, when staff at Philip Johnson's Glass House and the National Trust oversaw the replacement of the structure's original three-coat plaster ceiling, which had been sagging for several years and suffered from leaks. We spoke with Gregory Sages, executive director of Philip Johnson’s Glass House, and Ashley Wilson, Graham Gund Architect with the National Trust, about the goals, challenges, and surprises of the deceptively demanding undertaking. 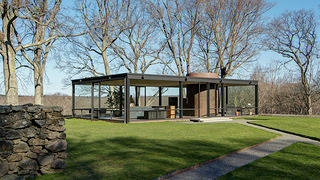 Philip Johnson's Glass House was completely encapsulated when the asbestos-filled ceiling was removed. Why was the ceiling sagging in the first place? Wilson: Johnson was being experimental. The ceiling is a three-coat traditional plaster ceiling. It hadn’t been touched since [its completion]. From the outside you could see the plaster ceiling and what was holding it together, so it was clearly not stable. 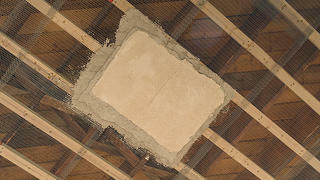 The ceiling was fastened to the joists with nails instead of screws. Sages: We originally thought it was caused by a leak from the roof, but when we opened it up, it became apparent it was no roof leak. There was a radiant heat system in the ceiling that had been decommissioned about two decades before Johnson passed away. None of the plumbers knew it existed. There were rumors, but we had no evidence. The copper tubing embedded in the ceiling had deteriorated, and it was probably leaking as well. It was also too heavy for the ceiling. Had the ceiling been drooping for a while? Sages: We don’t know for sure if the ceiling was sagging when Johnson lived here. A few years ago, EverGreene Architectural Arts did a temporary stabilization in the southwest corner. After later examination, we saw it was sagging in other places. What kind of problems did the failing ceiling create? Sages: On the western side the ceiling was probably sagging a good two inches. It prevented the door from opening. Wilson: It also had some water stains and age spots throughout. Some of the age spots and water stains visible on the original ceiling prior to its replacement. You considered a number of options for correcting the ceiling, and eventually decided to replace all of it. How did you reach that decision? Wilson: We hadn’t planned on replacing the whole ceiling [initially]. When we first started, we thought it was a local issue in two places, and we could go in and patch it up. Sages: It became apparent that the sagging was non-uniform. It was occurring sporadically and would have been something we would be facing over and over. Additionally, the original plaster had asbestos [as a binder]. If we began replacing sections, asbestos could be prevalent in the air. 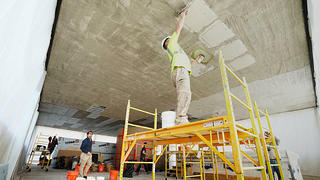 Crews protected the surfaces of the Glass House during the ceiling's removal. Crews getting ready to apply the base coat of plaster. This was a big capital project. How did you prepare for the ceiling replacement? Wilson: We had to raise the money for the project, write grants, and bid everything. It's been two years coming. Sages: We moved everything to storage except for the kitchen cabinetry and other cabinetry associated with the bedroom. They were significantly protected in place with wood-framed protections. The sculpture piece Two Circus Women by Elie Nadelman (1930) and a painting, Burial of Phocion, by Nicholas Poussin (1648-1649), were also moved. 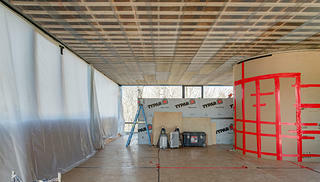 We also created a negative pressure environment to make sure all the asbestos was captured when we removed the ceiling. What were some challenges with the project? Wilson: The inclusion of asbestos was unexpected; the mitigation slowed down the process. We didn’t know it was attached with nails at first. We needed to do the plaster all in one day, too. If we didn’t complete the finish coat in one day, there would be a visible line from one day of work to the other, so we had 10 people working at once. We applied the bottom two coats and then spent time doing samples of what the top coat should look like. It took a long time to get the finish coat right. The plaster needed the [original] rustic feel to it. That was a challenge, replicating it without asbestos. A close-up of one of the plaster samples. Various plaster samples to determine what looks most authentic. Crews working on the new plaster coating. 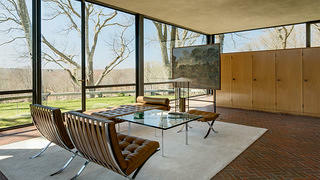 What should visitors expect when they visit Philip Johnson’s Glass House now? Sages: Visitors will experience a cooler interior thanks to the breeze from the open door [no longer blocked by the sagging ceiling]. Wilson: As an architect, I say it looks better because it had age spots and staining and sagging. Now it looks good. It has the appropriate color and texture. Philip Johnson's Glass House in the spring of 2018 following the ceiling replacement. The finished ceiling before returning the house's interior furnishings. The furniture and painting by Nicholas Poussin were removed during the work and are now back in the house. Elie Nadelman's "Two Circus Women" (1930) back in place. What are some of the next big projects planned at the site? 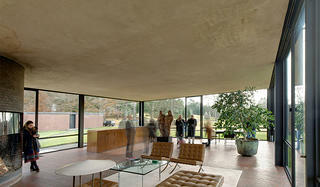 Sages: The ceiling replacement is the fourth major restoration project we’ve completed [at Philip Johnson’s Glass House]. All of the buildings need work. But the Brick House is going to be next, once we raise the funds. 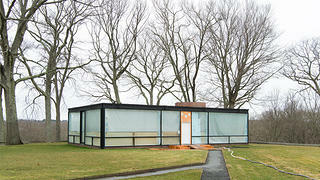 It was built contemporaneously with the Glass House. They are one composition—the Glass House cannot exist without the Brick House. It will be a complete restoration. We also want to move the artwork and furniture back into the Brick House. Wilson: The whole Glass House campus is about Johnson trying different ideas and construction techniques. As an architect, it was like his playground, so his buildings had quirky stuff. 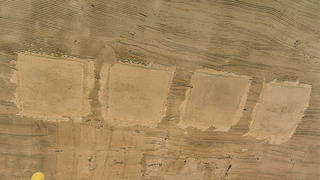 We’re always proud of the preservation work we can do at the site. It’s a great learning experience. Philip Johnson’s Glass House opened in May of 2018 for the season. In addition to having the opportunity to admire the brand new ceiling in the house, visitors will also be able to see the site's new exhibit, Personal Effect: Works from the Collections of Philip Johnson and David Whitney, in the Painting Gallery. 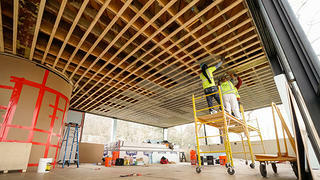 Want to learn more about the ceiling restoration at the Glass House from a preservation standpoint? Check out this story from our friends at Preservation Leadership Forum.